With Frank Turner headlining a sold out Wembley Arena on 13th April – Xtra Mile Recordings thought what better way to celebrate then to spend the night before drinking, being merry and revelling in our incredible roster. 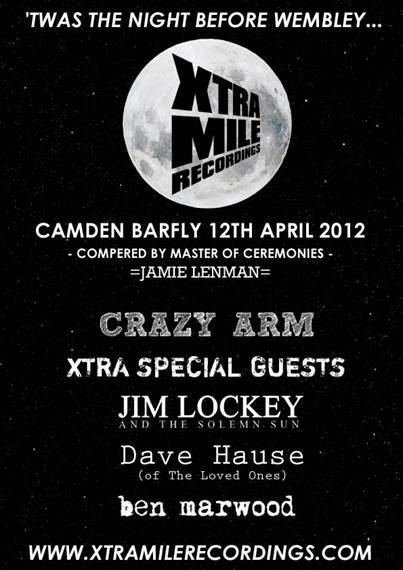 On the 12th April at London’s Barfly they will be getting the party started with a fantastic line-up of Xtra Mile acts that showcase the strength in their ever increasing stable. Confirmed to play are: The Loved Ones frontman Dave Hause who is currently on tour with Alkaline Trio; Devonian hard-twang roots punk rockers Crazy Arm; recent signings Jim Lockey & The Solemn Sun who will mark the release of their new album ‘Death’ out on 9th April and the undeniable talents of Ben Marwood complete the bill. In charge of keeping the night moving along without a hitch is the Master of Ceremonies – Jamie Lenman.